New York: Rizzoli, (2003), 2003. 1st Edition . Hardcover. Fine/Fine. Folio, (13 1/4" tall). 304 pages. First Edition, First printing with the "1" in the number sequence. Illustrated with photos, drawings, details, and plans. Dust jacket protected in a new mylar sleeve. Book is square, tight, and very clean. No previous owner's names or marks. McKim, Mead & White designed some of the most famous and important buildings in America during the late 19th and early 20th centuries. 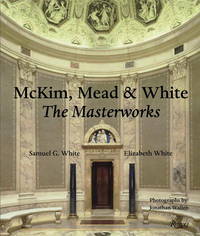 A magnificent monograph of the firm's work. A very handsome, gift quality copy. New York: The Museum of Modern Art / MIT Press (1977), 1977. First Edition . Hardcover. Fine/Fine. 4to. pp. 525, . 401 illustrations, 24 in color, 12 gatefolds. Dust jacket protected in a mylar sleeve, not price clipped. Other than four pages which have crease marks from being folded over, the book is very clean with no former owner's names or marks. A beautiful, gift quality book. U.S.A.: Wiley, 1981. Hardcover. Near Fine/No Jacket. Thick 4to. 785 pages. Illustrated. 70% new material in the seventh edition. One of the most important reference books for architects, engineers, landscape architects, interior designers, and contractors. This is a solid, tight, square, very clean copy. No previous owner's names or marks. Attractive. New Haven: The Art Institute of Chicago/Yale University Press, (2002), 2002. Hardcover. Fine/Fine. Square 4to. 224 pages. Illustrated. First edition, Third Printing. Dust jacket protected in a mylar sleeve. Davis Adler (1882-1949) was a Chicago architect designing homes and estates in the United States during a period known as the "great American house". Includes essays by Richard Guy Wilson, Pauline C. Metcalf, and Ghenete Zelleke with a foreword by Robert A. M. Stern. Photography by Bob Harr and Hedrich Blessing. This is an extremely handsome, scarce copy with no former owner's names or marks. Gift quality. New York: Reinhold Publishing Corporation, (1950), 1950. 1st Edition . Hardcover. Very Good/Good. Square 8vo. pp. , e-k, 220. Illustrated. Dust jacket protected in a mylar sleeve, not price clipped. Dust jacket has closed tears, 1/2' chips at the top and bottom of the spine, and some light foxing on the rear panel. Previous owner's name (Atlanta architect) is stamped on the front paste down and the title page. End papers are light tan age toned, otherwise the book is clean. A scarce book by the great Brazilian architect. New York: Harper & Row, (2003), 1983. 1st Edition . Hardcover. Near Fine/Very Good. 4to. pp. xxi, 1-441. Illustrated. Dust jacket protected in a new mylar sleeve. Book has just a touch of foxing on a few pages. No previous owner's names or marks. A very clean, square, tight copy. Milan: Phaidon Press, 2003. 1st Edition . Hardcover. Fine/Fine. Oblong Folio. 237 pages, . Illustrated in full color. Dust jacket protected in a mylar sleeve. Stated first edition in English. Hardcover red cloth. A few of the architects include; Tadao Ando, Alberto Campo Baeza, Mariano Clusellas, Engelen & Moore, Carlos Ferrater, Sean Godsell, Richard Meier, Satoshi Okada, Smiljan Radic, Werner Sobek. From the introduction, "Twenty Architects for Twenty Houses presents a series of different approaches to design, focusing on domestic space. Architectural visions particularly keen on grasping the signs of new modes of living that are beginning to emerge at the start of the twenty-first century." A scarce hard cover first edition in gift quality condition. Boston: Charles T. Branford Company, 1952. Second Printing . Hardcover. Very Good/Very Good Minus. 4to. 223 pages. Illustrated. Second printing. Dust jacket protected in a mylar sleeve. Dust jacket has a 1/4" chip at the top of the spine and has very light foxing. Book has some age toning on the end papers and a former owner's name (Atlanta architect) stamped on the front free end paper, otherwise book is very clean. New York: Alfred A. Knopf, 1929. 1st Edition . Hardcover. Very Good/Good. 8vo. pp. xv, , 3-215, . Illustrated. Dust jacket protected in a mylar sleeve, price clipped. Dust jacket has edge wear and a few chips. Binding and book are solid, square and tight. Previous owner's name tag on the front free end paper. A few pages have 1/2" closed tears. Otherwise very clean. By an architect, about people in theatre, art, architecture, and philosophy. A scarce copy with the dust jacket. Washington, D.C.: Three Continents Press, (1982), 1982. 1st Edition . Hardcover. Fine/Near Fine. 4to. pp. xiv, 1-296. Illustrated with over 200 drawings of architecture produced in 16 island countries of the West Indies. Map end papers. Dust jacket protected in a new mylar sleeve. A very clean, attractive book. No former owner's names or marks. This is the first such study of Caribbean "colonial" architecture of old buildings. Gift quality condition of a scarce architectural title.